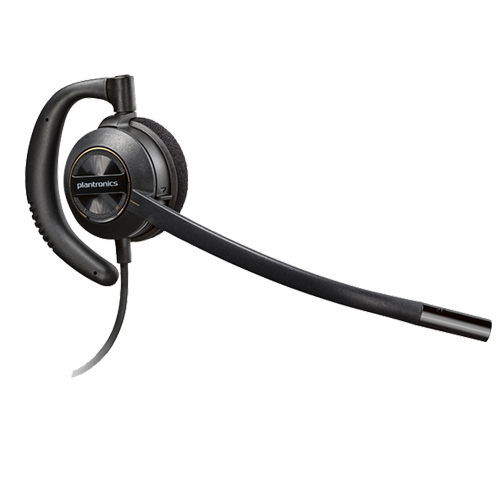 Plantronics HW530 Headset - Headsets Direct, Inc. This is a short introduction to the new Plantronics EncorePro HW530 corded business-grade headset. The HW530 is an over-the-ear model headset and extremely light weight at just 22 grams. This headset comes with a noise-canceling microphone; a soft foam ear cushion, so it rests up against your ear; and two sizes of ear loops (large and small). The ear loop simply snaps onto the headset, so it is easy to change or replace. The ear loop is also flexible and bendable, so you can get a good fit around your ear. The Plantronics HW530 headset comes with a noise-canceling microphone. This microphone will cut down on background noise, so your caller hears your voice over everything else, they are not distracted, and you don’t have to repeat information to them. The microphone also rotates, so this headset works on either the right ear or the left ear. This headset works best in an average-to-quiet office environment. If you’re in an extremely loud environment, you should look at a headband over-the-head model, because those headsets give you a little bit bigger ear cushion. The soft ear cushion rests up against your ear, so it does a decent job of sealing out sounds, and it is very comfortable. The HW530 headset also comes with a clothing clip. The clothing clip is very helpful to keep your headset in place. You clip it onto the edge of your collar or shirt, and now when you pull on the cord, it pulls on the clothing clip, it doesn’t pull the headset off, so it keeps the headset perfectly positioned all day. One very important thing to understand about this headset is, it terminates in what is called a quick disconnect. This headset will work on any application you desire, but you need a bottom cable or amplifier that goes between the connection and your device; the headset will not plug into a device without the cable or amplifier. So if you want to plug into a desk phone, PC, soft phone or VoIP application, tablet, or an iPhone, you will need to have the right cable or amplifier to use the headset on the device. So call us, tell us what the application is, and we’ll determine which cable or amplifier you need. The cables and amplifiers are sold separately. That’s why this headset will work on any device, but you have to get the right bottom cable. If you have any questions on this or anything else please give us a call at 1-800-914-7996, or visit us online at www.headsetsdirect.com.